One of your best friends is getting married, and it is up to you to plan the bachelorette party, but you have no idea where to start. There can be tremendous pressure to plan the best bachelorette party, but you should be focused on planning something the bride will love doing. Take a look at some bachelorette party ideas in Seattle that involve everyone having the time of their lives outside of the city below. Wineries- There are a lot of local wineries located around Lake Chelan that you can visit. Who wouldn’t want to spend an entire day sampling new wines with their closest friends? Catching up with old friends and making memories with new ones while enjoying wine sounds like a great time. 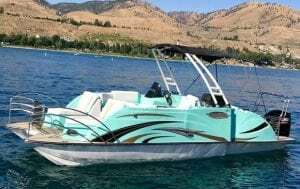 Lake Chelan- For a bride who is adventurous, you will need to plan something that is out of the city. What’s better than a day out on the water soaking up the sun? With a variety of rentals to choose from including party boats, personal watercraft, kayaks, paddle boards, wakeboards, and more, the entire bridal party will have a blast bonding through the exploration of the water. Our party boats can hold up to 22 passengers, so you do not have to worry about there not being sufficient space for all the bridesmaids. At Chelan Parasail & Watersports, we even offer parasailing for 1, 2, or 3 people at the same time. Hiking- If the bride is up for some hiking with great views, there are plenty of trails to choose from in this area. If you decide to plan a hiking/camping trip, it will require a little more planning from all of the bridesmaids to ensure they have the proper gear. If you are planning a weekend-long trip, you should consider planning on doing different activities on different days. If you visit a local winery and then plan on booking a party boat rental with Chelan Parasail & Watersports, the entire party can bring the wine they purchased with them onto the boat for them to enjoy while soaking up the sun. Make your reservation when you call us at (509) 682-7245 today.